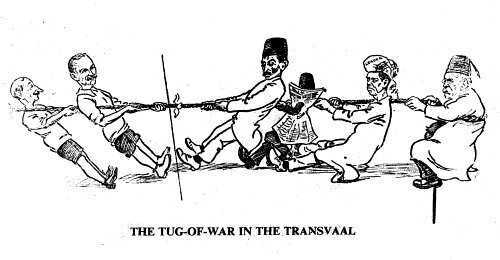 The Tug-Of-War In The Transvaal - Although some of the members of the Passive Resistance team are tiring, the Smuts-Farrar combination have not yet succeeded in winning the tug-of-war battle. – 1908. Despite severe repression, the struggle went on, with neither the Satyagrahis nor the Government giving way. Gandhi was jailed for entering the Transvaal from Natal without a permit in 1908. He was made to wear prison uniform and sweep the jail premises. From jail he told his followers: "Keep absolutely firm to the end. Suffering is our remedy. Victory is certain."